The Nifty SD50 (aka Nifty-Lift) is easy to rent, easy to use, increases productivity in high places, safer than a high ladder – even if you’ve never used an aerial work platform or lift before. I needed to paint my house which has 4 high peaks greater than 25 feet. My 32 foot ladder reaches all but one because it is above one of the other roofs. I also needed to paint the siding without leaving lap marks. In order to do that, I needed to paint each siding board end to end without letting the new paint dry. This is called keeping a wet edge. 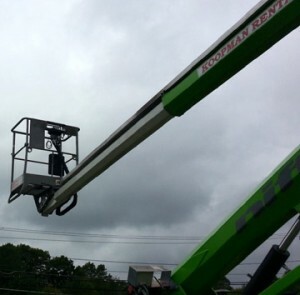 So for all the above reasons, I looked into renting an AWP – Aerial Work Platform. I checked on-line and visited a local commercial equipment rental place. The on-line vendors offered delivery and pickup of a variety of AWP’s for about $900 per week. The local equipment rental place was closer to $1200 per week with extras like clean-up and safety harness/ fall arrest harness. My local hardware store had a Nifty SD50 sitting out in the front parking lot. It was pretty intimidating up close. But the rental counter person had not had any bad experiences and said local delivery and return for a weekend rental would be about $600. They would take me through the operation and safety features. The Nifty SD50 is 4 wheel drive with soft tires that work well on a lawn. It has a reach of nearly 50 feet in height, or 28 feet horizontally and various points in between in a 360 degree space.. I took some measurements of my house and places where I could set up the machine and decided that I can reach nearly the whole house with it. I went back to reserve the machine. I also took the time to download the operators manual several days before using it to be as knowledgeable as possible when I got it. I recommend you do the same. There are two sets of controls used to operate it – all from the bucket. The first set are the driving and stabilizer controls. You can move forward or backward and turn using a joystick style lever along with a squeeze grip. This means you need two hands – one to squeeze and one to control. As a safety measure, you also need to step on the foot switch to get any operation. The second set of controls are for the bucket lifting and positioning. There are 4 levers: 1 – extend/retract main boom (the horizontal section in the picture attached to the bucket); 2 – first knuckle up/down. This is for the lower half of the boom to go up or down. Because it raises at an angle, lifting it causes the bucket to move backward and lowering it causes the bucket to move forward (when facing the controls). 3 – second knuckle will raise the bucket using the horizontal boom; 4 – rotate the entire boom left or right. These controls require you to also step on the foot switch to get any operation. Stepping on the foot switch causes the familiar “backup” beeping sound to warn others that you are moving. All levers except the rotate lever are intuitive. Facing the controls, pulling lever 4 up rotates the bucket toward your right while pushing it down makes it go left. There is a 5th but out of the way control to level the bucket. I did not need to use it at all. You MUST wear a fall arrest harness. You must. the boom can get a little shaky when extended fully horizontally and you can get a little shaken in the bucket. Wear it always. Nothing during my use caused me to need it, but OSHA requires it, and common sense requires it when your 35 – 50 feet up. Since you are moving in 3D space, you need to constantly look above, left, right, down while you are moving. You also need to watch the lower parts of the boom because they can hit things and cause great damage if you’re not careful. Move the bubbles to the center of each level by raising or lowering the stabilizer outriggers. 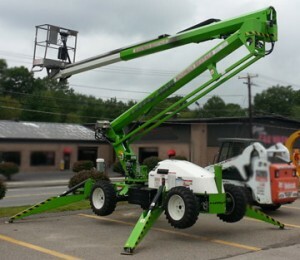 You must make the machine level and have the stabilizer outriggers holding the machine up before lifting the bucket. Built in safety devices will keep you on the ground if the four stabilizers are not bearing the load or if the machine is too out of level. 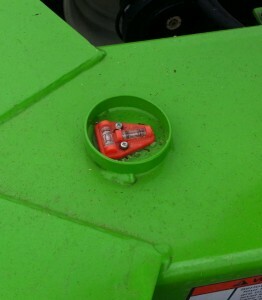 The level indicators are right below the bucket on the main chassis. I needed to paint the high portions of the house, but tree limbs were touching the roof and side and needed to be removed first. It was easy to raise the platform into the tree limb area being careful not to hit limbs above me and cut them away from the house. When all was clear, I could then start the painting process. Painting the house went fast because I could do the entire length of the side of the house without going up and down. The paint stayed wet and lap marks were minimal or non existent. I also took the time to inspect the top of my 32 foot chimney and was able to seal up any suspected leaking crevices. It took all of 15 minutes. My 32 foot ladder can’t reach the top so this was a great maintenance benefit. Notice the hardware under the bucket. Leave plenty of room beneath you when working above something like a roof. It’s a serious machine for serious work. You must follow the instructions and pay attention when the rental place goes over operation with you. Ask all the questions that come to mind. Make sure you are provided with a safety harness (fall arrest harness) or ask to rent one. Some places only sell the harness which is kind of silly to me if you are only renting the machine. Working in a 3D space means looking carefully where you are going, where the machine parts are moving to and also that the underside of the bucket has 2 feet of boom attachment hardware below it and you can seriously damage your roof or anything else that is under it when you are moving. Make sure everything is secure in the bucket and do not move anything if people are below you or near the machine. Always be aware of any nearby or overhead hazards like limbs, overhangs, beams, wires, etc. Check often. There is a first time for everything. This was no exception but it was intuitive and straightforward. It was easy to use and I got the job done far faster than I expected. I painted nearly 80% of my house in the 2 day rental plus cut tree limbs and inspected the chimney and cleaned the gutters. It was worth every penny of the rental/delivery fee!